Sometimes I feel like the girliest girl ever. Like the 2nd grade me who wore entire pink corduroy outfit situations. You see, I just painted my nails neon pink. Sometimes I look through my phone to show friends a quote on pinterest that totally relates to the topic at hand. Occasionally I compare life choices to shoe shopping. 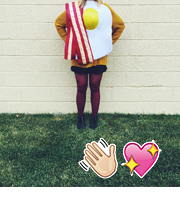 I still wear tights with hearts on them and the occasional all pink outfit. I sometimes feel like my style is 2nd grade chic. So when I saw this pesto on Sarah’s instagram, I knew I needed it in my life. 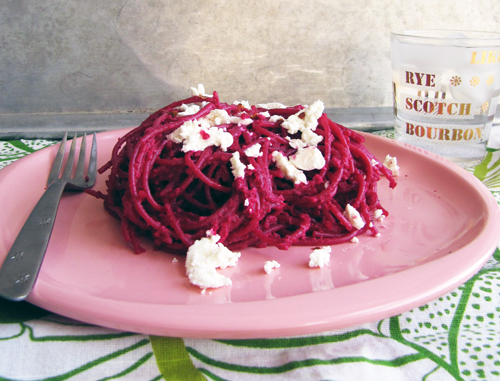 Not only is it full of tasty roasted beets and sun-dried tomatoes, it’s a magenta dinner. Girly pasta to the max. And with goat cheese, it’s my dream dinner. Preheat your oven to 375F. Trim beets from giant stalks. Place on a large square of foil. Drizzle with oil, sprinkle with salt and pepper. Rub each beet with the oil. Fold foil around beets and pinch the foil tightly trapping the beets in the foil pocket. Roast for 1 hour to 1 hour and 15 minutes or until fork tender. Remove from the oven and open the foil pouch and allow to cool a bit. Rub off the beet peels with the foil. Chop into pieces. Process in a food processor with the walnuts, sun-dried tomatoes, and red pepper flakes. Taste and add salt and pepper as needed. Meanwhile bring a large pot of salted water to a boil. Add pasta and cook until al dente. Reserve up to 1 cup of the pasta water and add it to the food processor and process pesto until smooth. I found that I only needed about 1/4-1/2 cup. Toss pesto with pasta. Serve sprinkled with goat cheese. 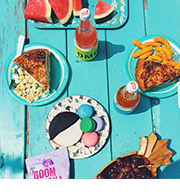 Enjoy your magenta dinner! I used to dance to the Go Go’s a lot in college. No big deal. LOVE this! 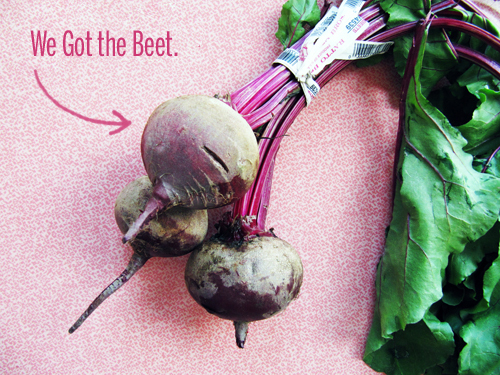 I needed a beet recipe in my life because I love them, but am never sure what to do with them! Yeah girl! I bet you’ll love this! Ah!! This is awesome! 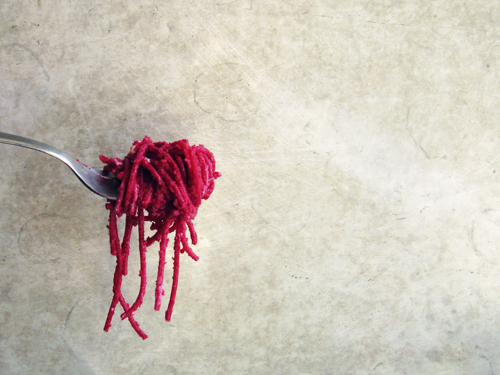 I love the color and beets and pesto and pasta, i.e., I love this. prettiest pesto! Let’s just be the girliest ladies and toast pink bubbly whilst slurping magenta pasta. Classy as a mutha. Beautiful beautiful!! 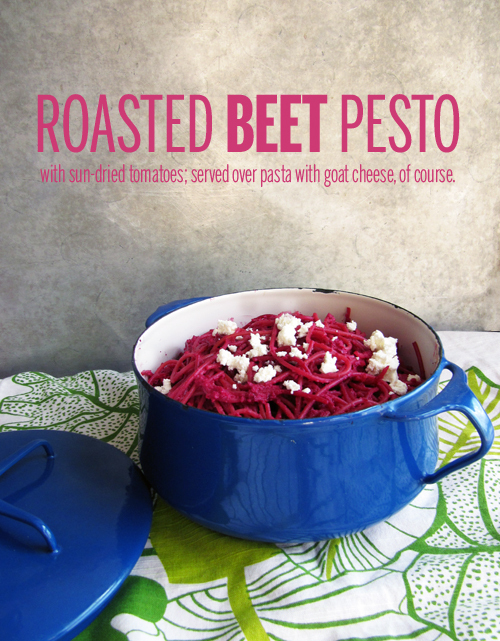 I have a beet and goat cheese risotto recipe that brings me pink dinner joy as well. Oh man, that sounds super good. and 2. I would totally rock my second grade piece – basically the Saved by the Bell intro translated into shorts – all day every day. Also, I most definitely want this pest on some pizza dough right now. Hell yeah man. You know whats up. When pesto is a pest, then just forget it, ya know? But yeah, I love the idea of magically turning a pasta dish into pizza and pizza into pasta. Like your pizasta situation! 2nd grade chic! Love it!! I cannot get over how pretty that magenta pasta is in that perfect cobalt blue pot. Eek!